Hannover and Stuttgart, Germany – Cutting costs, improving logistics chains, and making drivers’ lives easier: with technology to automate, connect, and electrify commercial vehicles, Bosch is improving efficiency and safety in logistics. 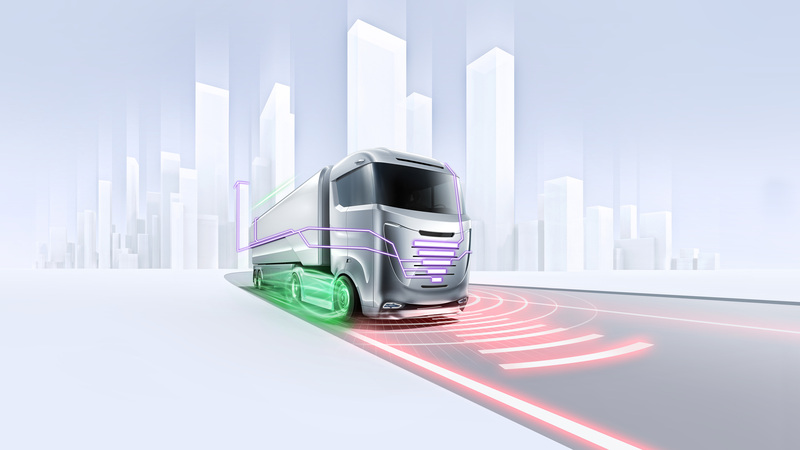 At the 67th IAA Commercial Vehicles in Hannover, the supplier of technology and services is presenting its innovations for tomorrow’s freight traffic. Electric trailer axle: With the electric axle, energy is no longer lost when braking, but is stored in a high-voltage battery where it can then be reused for a wide variety of applications, such as operating cooling compressors for trailers or providing starting assistance in construction vehicles. Compared with conventional diesel powertrains of the trailer, electric trailer axles can save up to 9,000 liters of fuel annually. 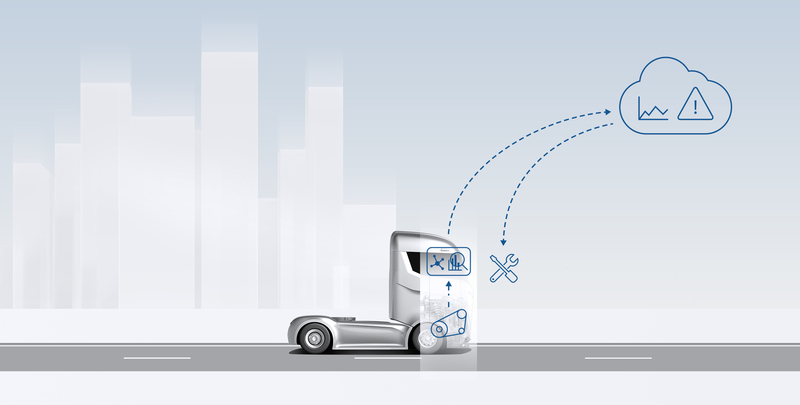 They also facilitate remote-controlled electric driving, for example on freight companies’ premises or at ports. To implement this, Bosch supplies tried-and-tested parts that are compact and readily available, such as an inverter, the associated ECU, and the vehicle control unit. The separate motor generator is available for installation as a complete electric motor, or the active components – rotor, stator, and resolver – can be integrated into the axle. 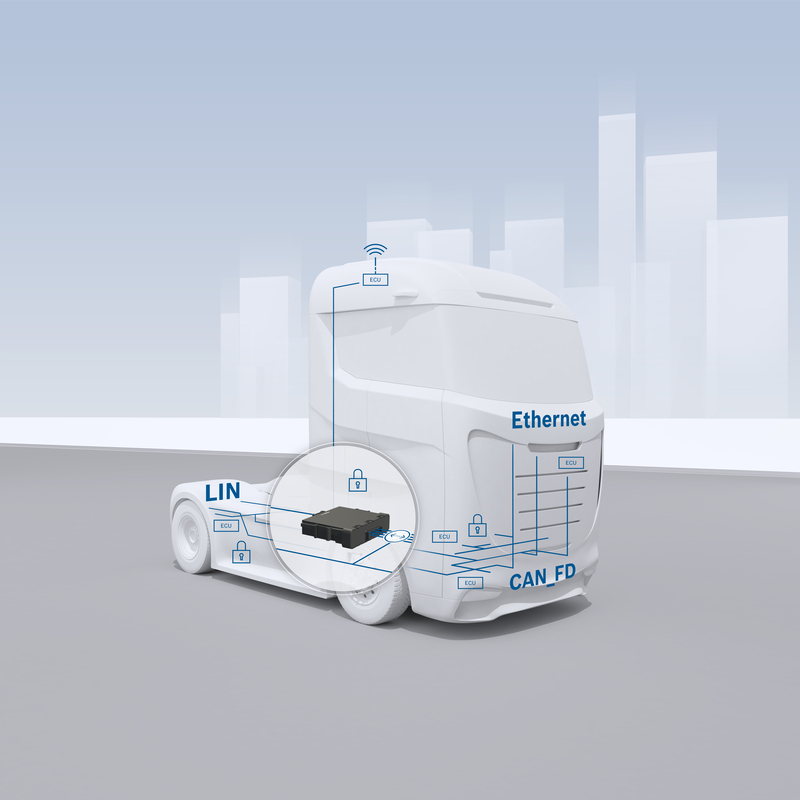 eCityTruck solutions: Bosch has developed a new, modular concept for electrical powertrains. eCityTruck solutions, as they are known, are designed for light commercial vehicles up to 7.5 metric tons and enable them to make urban deliveries with low noise and zero local emissions from the powertrain. For the new powertrain concept, Bosch combined an electric motor and power electronics into a single unit, thus reducing the number of components needed and making the powertrain more efficient and economical. Perfectly keyless: This keyless access system for trucks will soon let fleet operators manage their vehicle keys digitally. Freight and commercial vehicle rental companies can use a smartphone app to give their drivers access to specific fleet vehicles and to flexibly manage who has access and when. This is made possible by sensors installed in the truck that connect to an app on the driver’s smartphone. Once installed on the phone, the app generates a unique security key there that fits the digital lock in the vehicle. If the driver approaches the vehicle, Perfectly Keyless recognizes the smartphone, identifies the security key, and unlocks the door. As soon as the driver moves away from the truck again, the vehicle is automatically securely locked. 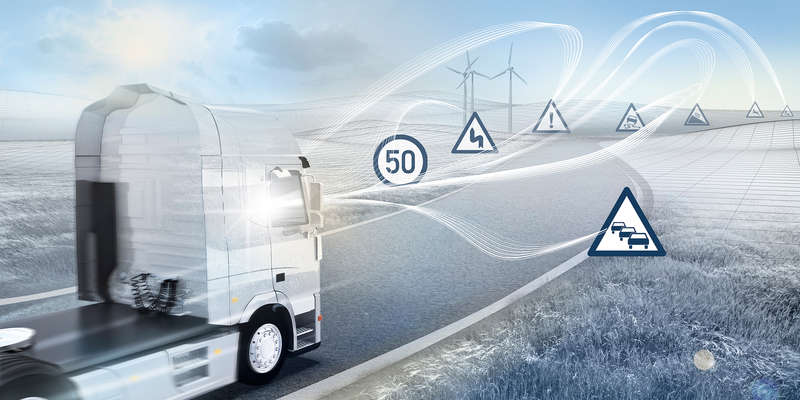 Connectivity platform for cloud-based services: Bosch uses a new connectivity platform to connect commercial vehicles throughout their service life, providing the technological foundation for such cloud-based services as predictive diagnostics and over-the-air software updates. The platform has two main components: the basic software module is the secure communication interface between the vehicle, the cloud, and the services, while the data management module enables commercial vehicle manufacturers or fleet managers to organize vehicle data, analyze it, and keep the vehicle software continuously updated. Predictive diagnostics: Vehicle downtime is usually unplanned and, particularly in the case of commercial vehicles, often results in significant economic damage. Bosch’s predictive diagnostics registers and evaluates vehicle component and system states and continuously reports them to the cloud. Based on this data, faults can often be predicted and thus resolved in time. This reduces maintenance and service costs for commercial vehicles, and the lower number of breakdowns increases their availability. Electronic horizon: In the future, Bosch’s electronic horizon will become smarter with every trip. This service is based on high-definition maps with topographical data for the route ahead. Engine and transmission management then takes this data into account in order to select the most efficient driving strategy possible and further reduce consumption. The electronic horizon has been available for several years, but now Bosch is enhancing it. In the future, the function will determine whether the information stored in the map agrees with actual conditions on the road. For example, if the vehicle camera detects a speed limit sign on the road that specifies 30 kph, but the map says the limit is 50 kph, the truck’s navigation system will learn the new speed. In the future, this information will also be shared with other trucks via the cloud. The smart electronic horizon is set to go into production in early 2019. Freight monitoring: Where are my goods and how are they doing? These are questions logistics specialists and customers ask. 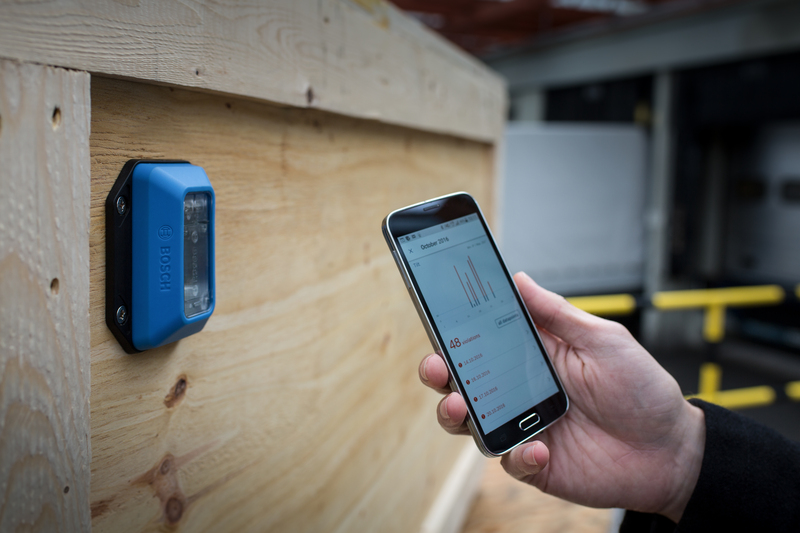 Bosch’s Transport Data Logger provides answers and makes the goods supply chain transparent. Measuring around 10 square centimeters, the small box with integrated sensors monitors the transport of sensitive goods and measures temperature, humidity, tilt, and shock events during transport. The measured values are displayed in a smartphone or tablet app and documented. If certain values are exceeded, the app triggers an alarm and potential damage to the goods can be detected early on and attributed to the person who caused it. 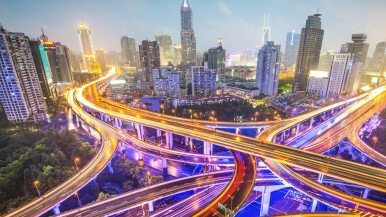 Central gateway: The central gateway controls data exchange between the ECUs in the truck and the outside world across all bus systems, and is therefore the central communication node for connected commercial vehicles. Modern transmission and encryption technologies make the data exchange particularly secure. 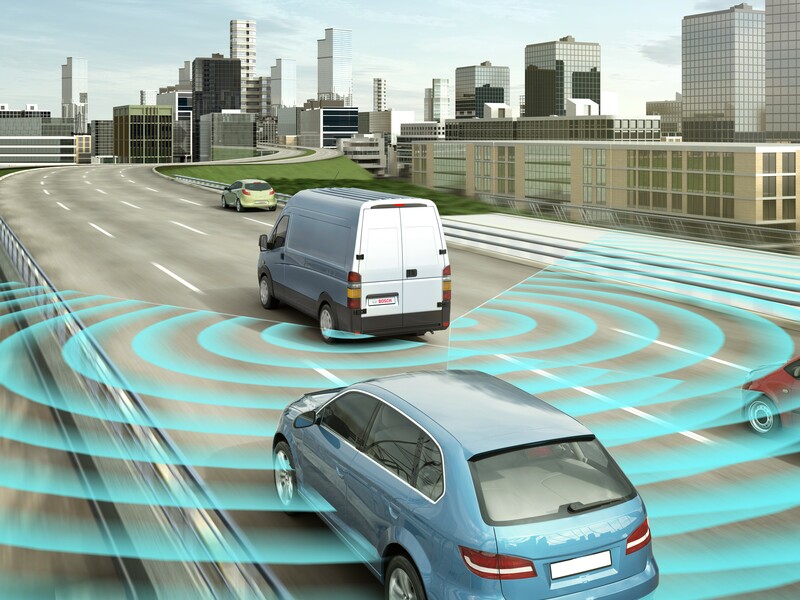 They prevent unlawful access to the vehicle network using firewalls or the intrusion detection system developed by Bosch subsidiaries ETAS and ESCRYPT. Digital side-view mirrors: The digital mirror camera system developed by Bosch and Mekra Lang for side-view mirrors is going into production in 2019. 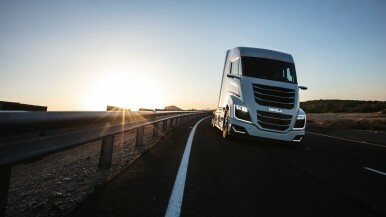 It replaces the two large mirrors on the outside of the vehicle’s cab with video sensors, which reduces drag and lowers fuel consumption by as much as 2 percent. Images from the cameras are displayed in real time on high-resolution monitors in the driver’s cab. The system adjusts the monitor display according to situation: long view on the freeway, large angle of view in city traffic, and high contrast for night driving. . And thanks to Bosch’s EasyFit camera system, existing truck fleets can also be retrofitted with digital surround view. This system is based on four ultra-wide-angle cameras that show a 360-degree view around the vehicle. Digital instrument cluster: To ensure easy and distraction-free operation of the ever expanding connectivity, driver assistance, and infotainment functions in trucks, Bosch is bringing digital instrument clusters into the cockpit. In addition to the conventional speedometer view, the display will show function information, route planning graphics, and images from the reversing camera or night-vision device, prioritized according to the driving situation. Drivers are always shown exactly the information they need at any given moment, which reduces complexity and allows them to focus entirely on the road. Turn warning: Especially in downtown areas, truck drivers need to keep an eye on traffic, traffic lights, and road signs, all while also watching out for pedestrians and cyclists. 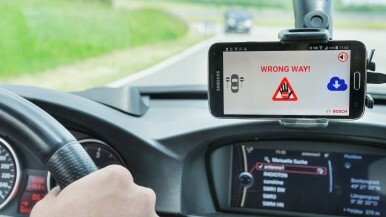 In the future, Bosch’s turn warning will assist them with turning maneuvers in complex situations. Radar sensors detect crossing pedestrians and cyclists in ample time and warn truck drivers of an imminent collision, allowing them to promptly brake or take evasive action. 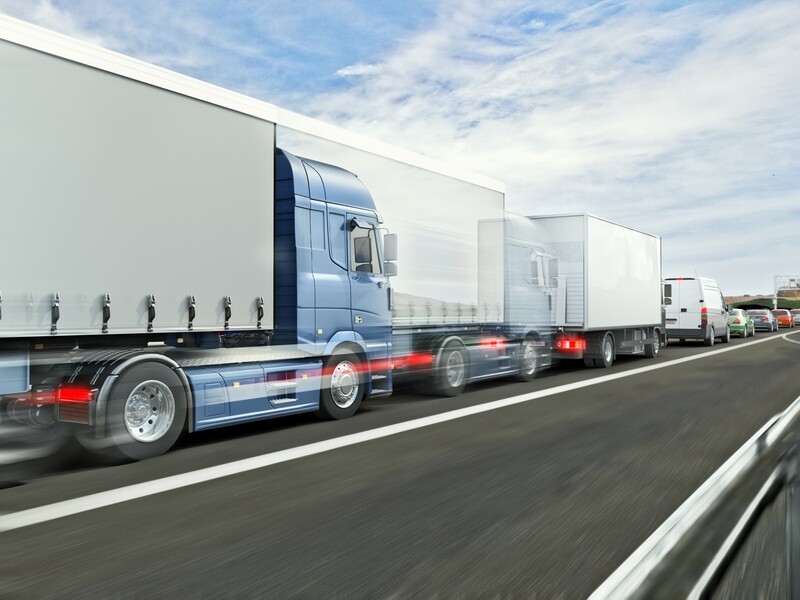 Blind-spot recognition: Whether in the city or on the freeway, it is often difficult for drivers of commercial vehicles to maintain an overview of the areas next to and diagonally behind them. The blind-spot recognition uses radar sensors to monitor the areas next to the vehicle, detect other road users, and warn the driver. This function also alerts drivers of imminent collisions when changing lanes. 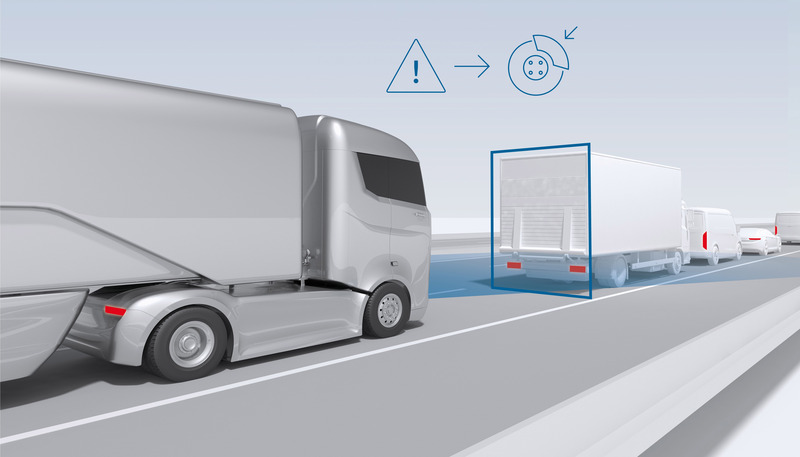 Predictive emergency braking: Systems for automatic emergency braking for commercial vehicles have been mandatory across the EU since fall 2015 for all trucks with a gross vehicle weight of more than eight metric tons. Bosch’s solution uses a combination of a multi-purpose camera and a radar sensor, both installed at the front end of the truck. The radar sensor detects objects in front of the vehicle and determines their speed as well as their position relative to the vehicle. If there is a risk of collision, the system warns the driver. If the driver doesn’t react, the system automatically triggers an emergency braking maneuver. Lane assistants: These use camera data to ensure that trucks don’t unintentionally leave their lane. The lane-departure warning alerts drivers that they are in danger of drifting out of their lane by, for example, vibrating the steering wheel. The lane-keeping assistant keeps the vehicle in its lane by making gentle steering interventions. Servotwin: The Bosch Servotwin electrohydraulic steering system improves the efficiency and convenience of heavy commercial vehicles. It offers speed-dependent steering support and consumes less fuel than purely hydraulic steering. Thanks to its electronic interface, the steering system is simultaneously the basis for driver assistance functions such as lane assistants or cross-wind compensation. The steering system has many fields of application, including in Mercedes-Benz’s self-driving Actros. 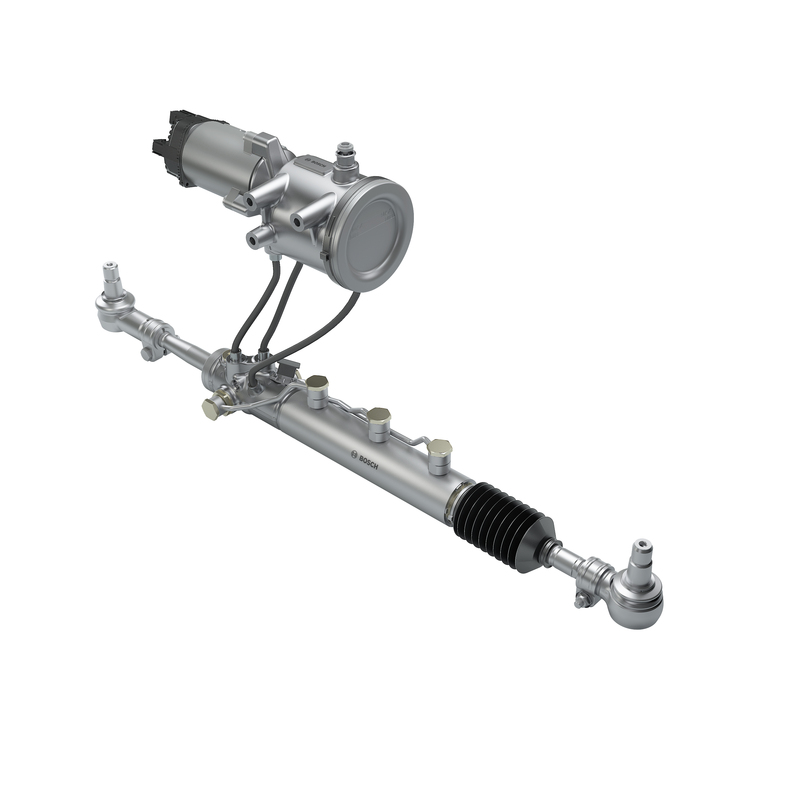 Rear-axle steering: The electric rear-axle steering system (eRAS) lets commercial vehicles with three or more axles use the leading and trailing axles to steer. This makes the turning radius smaller and reduces wear on the tires. Based on the steering angle of the front axle, transmitted by CAN bus, the steering system determines the optimum steering angle for the rear axle. After driving around a bend, the system also assumes the task of straightening out the wheels. Only when the vehicle is actually being steered does eRAS consume energy. 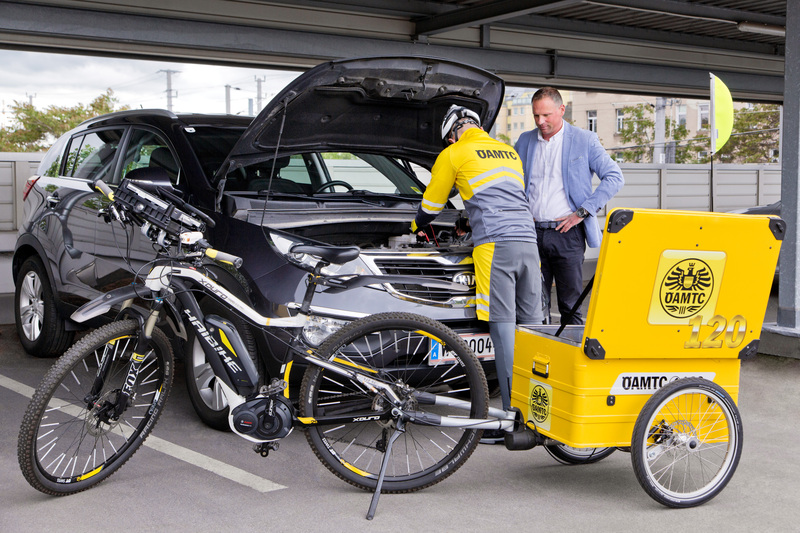 Cargo tricycle with 48-volt powertrain: Light electric vehicles on two, three, or four wheels are playing an increasingly important role in the fast and flexible delivery of goods within cities. Bosch’s 48-volt drive system is also used to power the Ligier cargo three-wheeler, which delivery services use to carry letters and parcels the last mile to their destinations in urban areas. 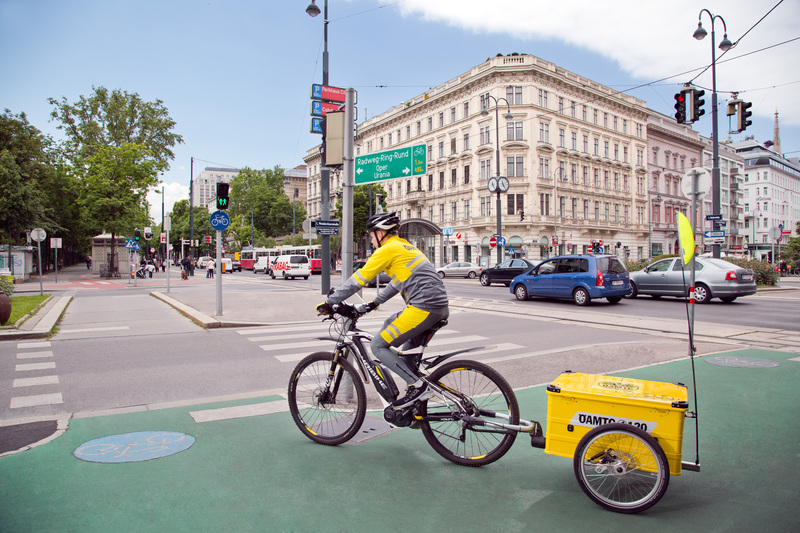 E-cargo bike: Electric cargo bikes are taking cities by storm and making the transport of food and small shipments fast and flexible. 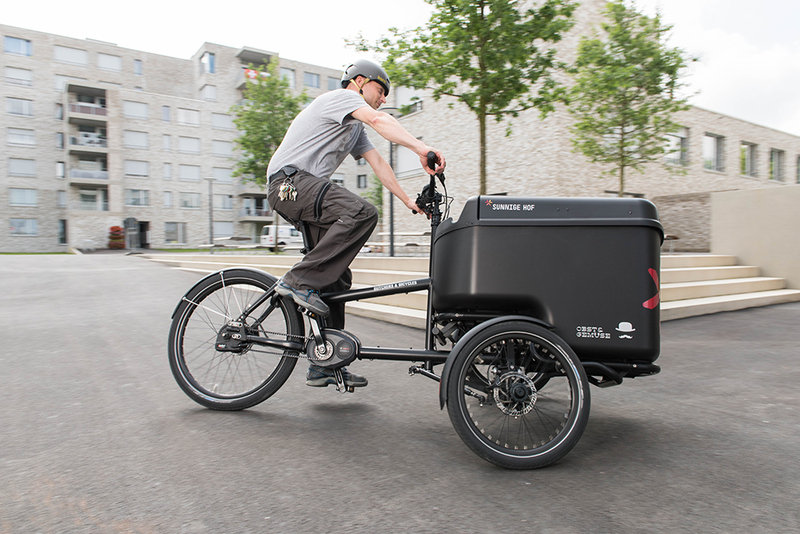 Bosch’s Performance Line e-bike powertrain powers cargo bikes with a maximum torque of 63 Nm, ensuring a powerful start, even on uphill stretches in the city. With a second battery pack and favorable conditions, these bikes can travel up to 180 km – even when loaded. Nyon, the on-board computer, finds the fastest delivery route, as well as showing drivers the current time, speed, recommended gear changes, operating range, distance, and the current battery charge. Thermal management for electric vehicles: Bosch uses smart thermal management to increase the operating range of electric vehicles by as much as 25 percent, as selectively distributing temperatures in the battery improves its efficiency. Bosch’s thermal management system also lets each powertrain component be operated within its optimum temperature range, and the system always directs the heat and cold for the interior of electric vehicles to wherever it’s needed. Exhaust-gas treatment: AdBlue injection systems, in conjunction with selective catalytic reduction (SCR) catalytic converters, support comprehensive exhaust-gas treatment. This plays a major role in ensuring that commercial vehicles can stay within the legal exhaust emission limits. The Denoxtronic 2.2 evo dosing system offers flexible configuration options and quickly pays for itself in fuel savings. 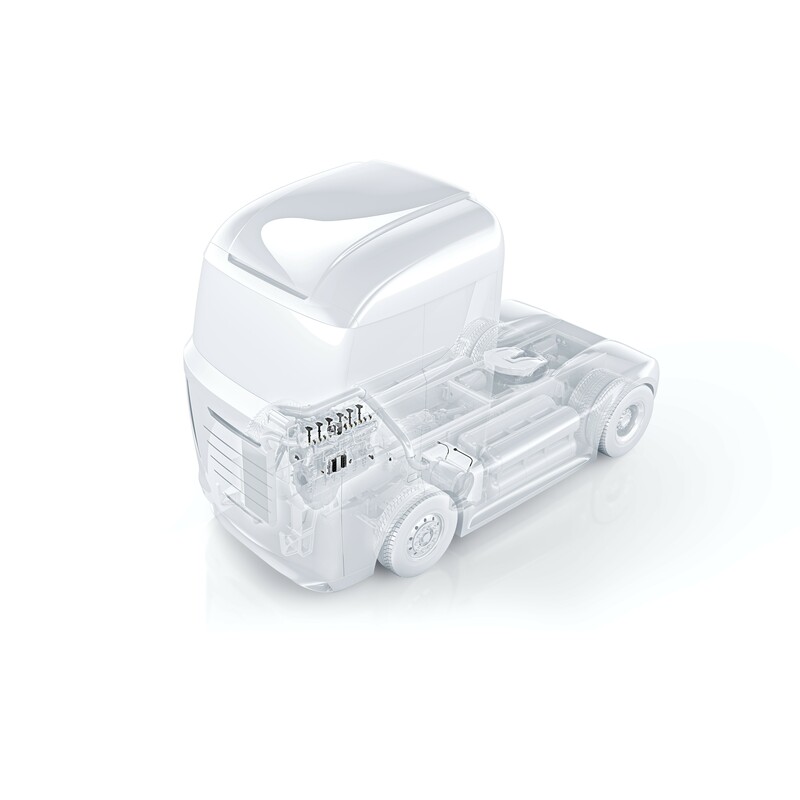 For light commercial vehicles, Bosch offers a particularly compact version, the Denoxtronic 6-5. The 6-HD version, with a dosing rate of up to 15 kg/h, is particularly suitable for high-capacity engines in heavy commercial vehicles. Modular common-rail system: The modular common-rail injection system (CRSN) for commercial vehicles and off-highway applications ensures efficient fuel supply in diesel engines. It can be used in various configurations in assembled components with up to eight cylinders and outputs of up to 850 kilowatts. Depending on the segment and market, the system can last up to 1.6 million kilometers in on-highway operation, or 15,000 hours off-highway. Compared with conventional systems, it can reduce fuel consumption by as much as 1 percent – in a heavy-duty truck, this corresponds to savings of up to 450 liters of diesel per year. The system is also designed for the electrification of the powertrain. Baseline common-rail system: Baseline common-rail systems, with up to 2,000 bar system pressure for medium- and heavy-duty vehicles as well as off-highway applications, are perfectly tailored for the requirements of emerging markets. Among other things, the system includes a broad product range of oil-lubricated pumps and Baseline injectors, and because it is standardized, systems integration, calibration, and validation for new applications are fast and efficient. Variable oil pump: Existing oil pumps work with constant oil pressure to ensure that the engine is lubricated and the pistons are cooled at all times. The new Bosch solution for commercial vehicles can adjust its displacement volume, so it supplies exactly the right amount of oil in any situation. As a result, it requires less torque at certain stages of operation, so it uses up to 1 percent less fuel. 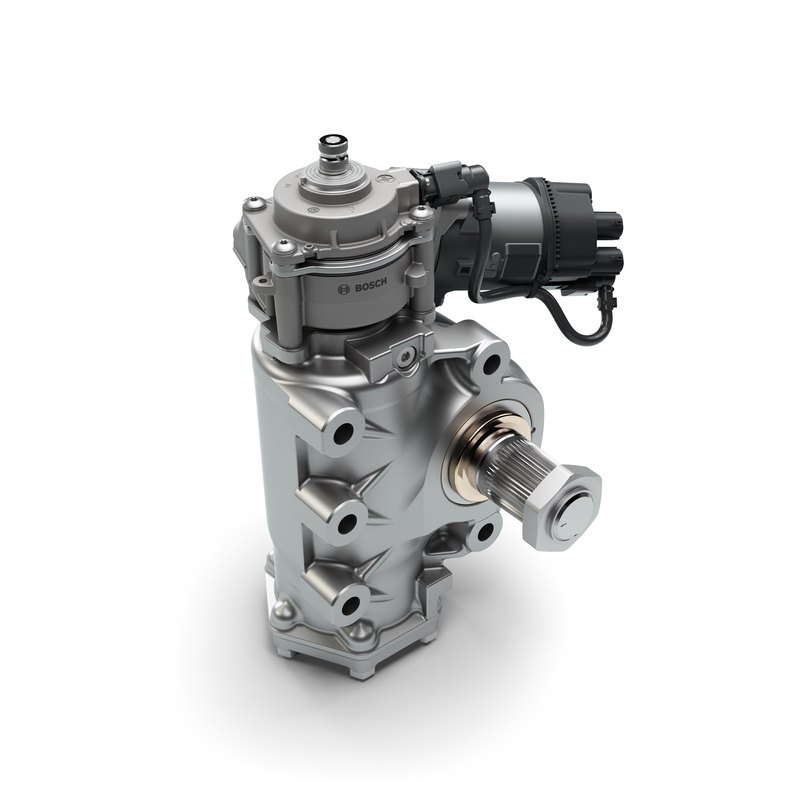 The variable oil pump is based on the multi-vane principle and is available in three designs: with oil pan, in a compact front design, and as an engine cover. Natural-gas drive systems: Global market forecasts for the coming years see double-digit growth rates in natural-gas vehicles, due mainly to their lower emissions of carbon dioxide and particulates compared with liquid fuels, and the fact that these vehicles run much more quietly. The Bosch portfolio includes the ECU, components for fuel injection and air management, and a number of sensors. These components are powerful and compact, and have been tried and tested for many years in the field. 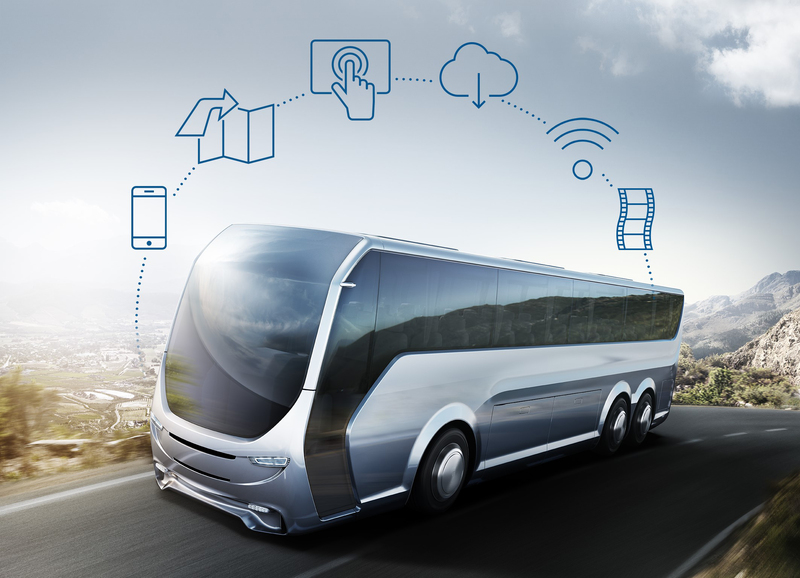 Coach entertainment series: Bosch’s new Coach entertainment series brings modern multimedia and connected technology to the bus segment. All system components, such as high-resolution monitors and the central head unit, are connected via Ethernet AVB. AVB stands for audio/video bridging – a transmission technology that ensures uninterrupted and synchronous audio-visual rendering in the automotive segment, even for high-definition (HD) films. The new Ethernet wiring is particularly lightweight and saves valuable installation space in the vehicle. Coach head unit: The central Coach head unit lets bus drivers see all important information at a glance, while a touch screen lets them control the integrated navigation maps and the entertainment in the passenger compartment, and the mySPIN smartphone integration provides access to apps. All functions can also be voice controlled, and phone calls can be made using the integrated hands-free device.